Ok, not precisely there because I’m not planning to move to Thailand or anything. But isn’t this place amazing! It’s just one of the treehouses I found out about while working on New Treehouses of the World. The author, Pete Nelson, owns his own treehouse building company called Treehouse Workshop based in Seattle, WA. He even gives treehouse building seminars. 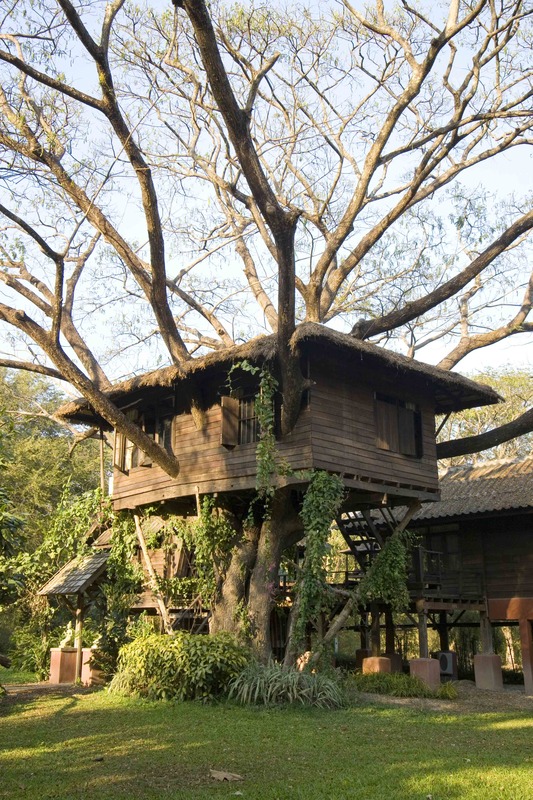 The book includes many treehouses he built himself, along with ones he has discovered all over the world. Working with him was a great experience and as soon as my mother saw this book she wanted to know if he’d build us a treehouse, too . . . haven’t followed up with him about that yet. My friends and I wanted to build a treehouse when we were kids, but Florida is relatively short on good house-bearing trees, so it turned out more like a platform hut than your typical house. We scouted out three perfectly spaced palm trees in my neighbor’s wild backyard and put up a triangular platform between them (ok, we had a little help from her dad). I remember spending all day collecting palm leaves to help “thatch” the roof. It turned out pretty raw, but it served its purpose: official neighborhood clubhouse. We would all tromp through those woods collecting berries, moss, and pond scum (yep, that seems gross now), and cart it up to the clubhouse to make “stew.” There were also official clubhouse rules and someone was President, though I can’t remember who now. Pete’s treehouses are a lot more sophisticated. Most of them could be vacation homes, with beautiful verandas and balconies, and even running water and electricity. The book really captures what’s magical about living in the trees. People get excited when they see a treehouse, not just because it takes them back to being a kid, but also because there’s something almost primeval about living in the forest. I hope you’ll take a look at the book and watch out for my name in the acknowledgments (the first book in which I ever appear! ).